Pro-Portionally Designed: Tis only a flesh wound! I. LOVE. BURGERS. Specifically double cheeseburgers and for anyone who has viewed my shop I'm sure you got that impression. 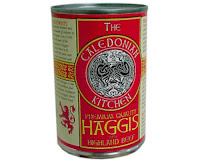 However, I don't know that I'd be willing to eat one that was canned. 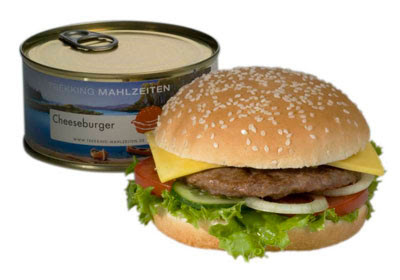 German company Trekking Mahlzeiten, has developed the canned burger for those who love both burgers and the outdoor life. To prepare you boil the can for a few moments then open and enjoy a hamburger complete with ketchup and pickles. Despite how unsure I am that I would be willing to eat this I am more than certain that if I saw this item anyplace for sale I would buy it. What does any of this have to do with the blog title "Tis only a fleshwound!"? Nothing. Absolutely nothing. It has to do with the fact I got an early Christmas present. A new tattoo. Mmmmmmmmmmmmmmmmmmmmm ink - loves it! No pics just yet because it's fresh. But soon - I pwomise. And in that post I will tell you where I got it and a bit about the experience and the tattoo artist who did it. 14 Days Til' Christmas. Really?